Every people strives to appear stylish during the day. Whether they are going out with friends, picking up groceries, walking the dog, and even when they’re going on a trip. In fact, men take special care to look good when they’re traveling. Obviously, no travel outfit is complete without a bag to match. That’s where the Louis Vuitton Keepall in black and gray fits in perfectly! Let’s face it — every man needs a classic black or gray Keepall in their life. However, these bags tend to have plain, unimaginative designs, and they don’t do much to compliment your wardrobe. Luckily, this Louis Vuitton Keepall is simple, yet stylish, so it will make you look like the sophisticated traveler you are. Let’s take a look at the design. The Louis Vuitton Keepall 55 comes in black and gray and features a monogram eclipse canvas. It has a textile lining and an epi cowhide leather trim. The monogram design is silver which compliments this black/gray Keepall perfectly. Furthermore, it’s large enough to pack a weeks worth of clothing into, yet it’s surprisingly easy to carry around. 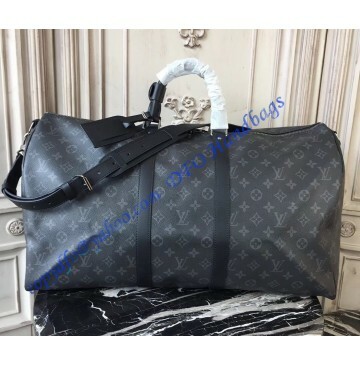 The Louis Vuitton black and gray Monogram Keepall is 55 cm (21.7 in) wide, 30 cm (11.8 in) long, and 25 cm (9.8 in) deep. It comes with a removable shoulder strap which you can adjust to any size. A double-zip closure with a padlock ensures that all your belongings remain inside. Furthermore, there is also an internal pocket where you can keep your most prized possessions. Yet another beautiful addition to this Keepall is the leather name tag. Honestly, this bag is perfect for traveling! You can get this Louis Vuitton black and gray monogram Keepall for $353.00 here.